A wagon and brake assembly includes a wagon including a platform having a top surface, a handle section attached to a proximal platform end, and sides protruding upwardly from the platform. The platform is provided with a bore that is intercalated between the platform top and bottom surfaces. Wheels are conjoined to the wagon. A rear axle has opposed ends attached to the rear wheels and is distally spaced from the bore. A pair of support brackets has opposed ends abutted with the platform bottom surface and the axle. A braking mechanism is included for inhibiting a rotational movement of the axle and the rear pair of wheels. The braking mechanism is engageable with the axle while being spaced therefrom, is spaced from the rear pair of wheels, and is medially disposed therebetween such that a user can quickly and efficiently access the braking mechanism during operating conditions. 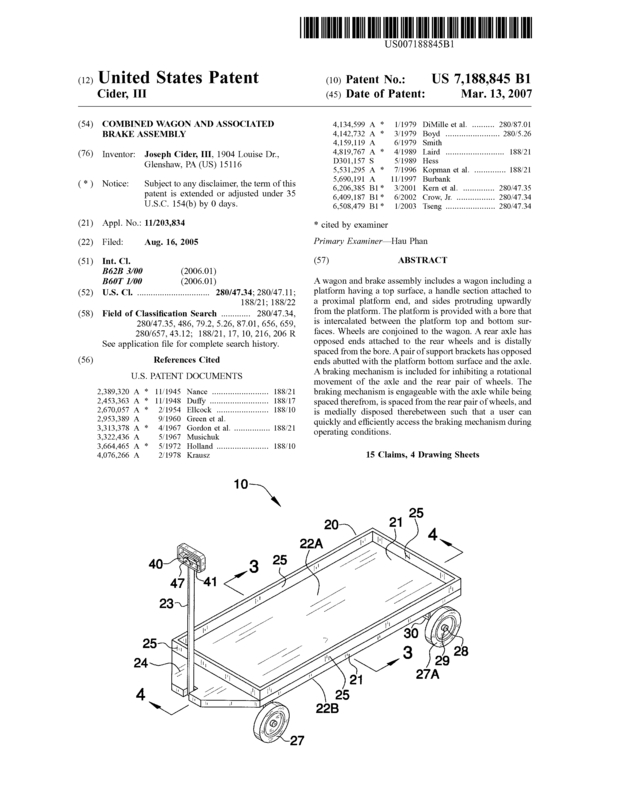 Page created at 2019-04-23 6:36:40, Patent Auction Time.